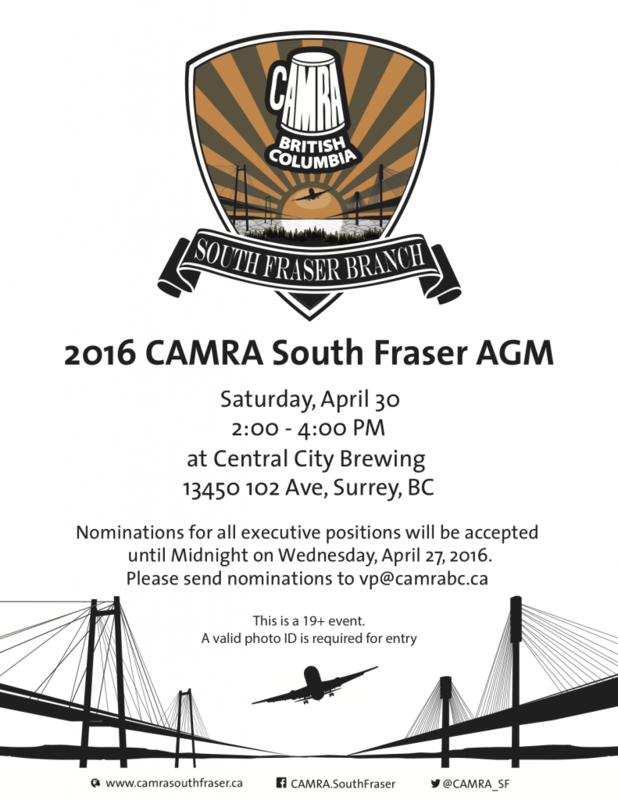 Earlier this week, we announced the Call for Nominations and AGM event information for the CAMRA BC – South Fraser branch. This is the product of a massive effort to get everything in place to ensure a successful rebuild. The South Fraser region represents an enormous swath of the Lower Mainland, and it is paramount that we equip the branch – and its’ future Executive team – with the support and resources it needs to properly support its’ community. Our BC Vice President Janna Gabrek has gone above and beyond to organize this – please take a moment when you see her next to thank her for championing this project! The AGM will take place on Saturday, April 30, from 2pm-4pm at Central City Brewing in Surrey. Nominations for all board positions are open, and can be sent to Janna at vp@www.camrabc.ca . Note that nominations will be accepted until midnight on Wednesday, April 27, 2016. You must hold an active membership in order to be able to vote. Many CAMRA Executive members will be present to speak with members, answer questions and help get the new SF Executive setup in their roles. I encourage you to approach any of us, introduce yourself and have your comments and questions heard! A few establishments south of the river have asked for media that they can share, print and post in their businesses to promote the AGM and help cultivate interest. Our Vancouver Communications Director Ashleigh Begg has created a poster for this very purpose, which you can share on social media, print copies of and put up around town (we ask that you obtain permission from establishments before putting these up in their places of business). Your input and support are invaluable, and I highly encourage you to attend. This is your South Fraser branch, and your community.